Sync orders, shipments and inventory between Jetti and WooCommerce. Jetti allows you to connect and sync sales, purchase and inventory data across multiple e-commerce stores and offline sales channels. This is great if you're shipping items out the door faster than you can handle. Go to the WooCommerce -> Settings -> API in the WordPress admin area, and then make sure the “Enable the REST API” option is checked. This should be checked by default. Click on the Keys/Apps tab. You will see your API keys there. If you don’t see the keys, click on “Generate Key”. Enter Jetti for the description and Read/Write for the permissions. Enter these credentials under the settings page for your WooCommerce store in Jetti. Migrating from WC Vendors? You might have already mapped out the products to the vendors. However, after migrating to Jetti and disabling the WC Vendors plugin this data will no longer be available. So, the above steps will still need to be taken. Out the box, WooCommerce doesn't have a way to set the vendor for each product. In order to route the sales and update inventory, you'll need to set up a new attribute for the vendor and assign this to each product. (Optional - Skip if you already have a vendor field) Create a new attribute Under Products > Attributes. The name can be something like Vendor or Brand. The type should be set to select and we recommend setting the orders to name. Set the name of the vendor field in Jetti for your WooCommerce store. 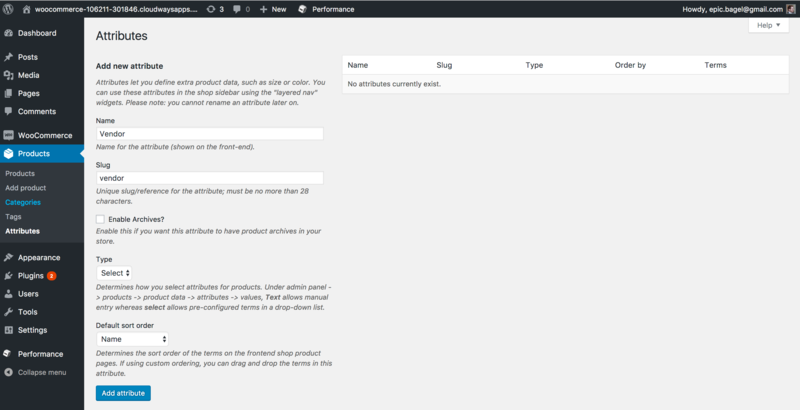 In WooCommerce, add your vendor names to the product attribute settings page. Once all your vendors are added, you can then go to each of your products and assign the vendor. When assigning the vendor to the products, Used for variations should not be checked. If you assign multiple vendors to a single product, Jetti will just use the first one in the list.